Twelve previously unreleased Jimi Hendrix tracks are to be released on a new album next year. The late musician’s website revealed the songs on People, Hell and Angels were recorded in 1968 and 1969. It is thought Hendrix had intended them for First Rays Of The New Rising Sun, his follow-up to Electric Ladyland, which he was working on when he died. The album is due to be released in the US on 5 March, although a UK release date has yet to be set. 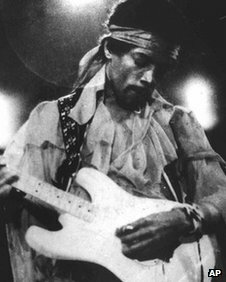 Hendrix’s website said the tracks suggest “new, experimental directions”, as he worked on material separate from the Jimi Hendrix Experience. It added he explored “fresh diversions from his legendary guitar work”, trying out horns, keyboards, percussion and a second guitar. Rolling Stone magazine revealed the album’s cover artwork on Wednesday. Hendrix is also about to hit cinemas around the world, with his set from the 1969 Woodstock festival released later this month. It will be screened at more than 30 cinemas across the UK from 29 November to celebrate 70 years since the musician’s birth. The reassembled archive footage captures Hendrix premiering a new band and performing tracks such as Voodoo Child (Slight Return), Fire, Purple Haze and a rendition of Star Spangled Banner. 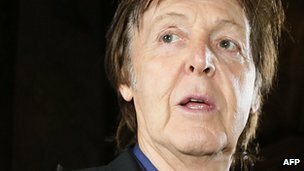 Sir Paul McCartney has joined the line-up for a charity single supporting the Hillsborough campaign. The track, which is favourite to be Christmas number one, has had its first play in Liverpool in front of families of victims of the 1989 disaster. Robbie Williams, former Spice Girl Mel C and Gerry Marsden are among the other stars on the cover of The Hollies’ 1969 hit He Ain’t Heavy, He’s My Brother. Bookmakers expect it to beat the X Factor winner to the festive top spot. Ninety-six Liverpool football fans died in a crush at the Hillsborough stadium in Sheffield during an FA Cup semi final in 1989. Margaret Aspinall, whose 18-year-old son James was among them, said listening to the new version was emotional because James had bought her the original on record just three weeks before he died. “When I was listening to it, to be honest with you, it was sad because I just shut my eyes and I saw my son handing me the record,” she said. Mrs Aspinall chairs the Hillsborough Family Support Group and said it was important that Sir Paul, who sings and plays guitar on the track, was on board. “He decided to do it and I think that’s lovely because he’s from Liverpool, he knows how Liverpool people work and he understands us,” she said. The single release comes after a report found that police officers’ statements were altered after the tragedy and up to 41 lives could potentially have been saved if the response of the emergency services had been swifter. Proceeds from the single, which is released on 17 December, will go towards legal costs in the families’ continued fight for justice. Gerry Marsden, who fronted chart-topping Merseybeat band Gerry and the Pacemakers, said: “The original was fantastic so we just hope we did as good a job with his one as The Hollies did with the original. X Factor star Rebecca Ferguson, Paloma Faith, Beverley Knight, Frankie Goes To Hollywood’s Holly Johnson and The Clash guitarist Mick Jones are among the other musicians on the recording. They joined former Liverpool manager Kenny Dalglish, comedian John Bishop and Liverpool MP Steve Rotheram on the line-up, which was put together under the name The Justice Collective by Robbie Williams’ former songwriting partner Guy Chambers. The song is 1/2 favourite to be Christmas number one with bookmakers Ladbrokes, William Hill and Paddy Power. Its nearest rival is the eventual X Factor winner at 2/1, according to William Hill and Paddy Power.